It definitely is sweater weather in Vancouver right now. We are moving closer and closer to Christmas and the end of another year, can you believe it?.. I love sweaters and since late fall and winter is the only time we get to wear them, I make sure I use them many different ways: on their own, layered on top of a dress shirt or a turtleneck, with pants, with skirts, even over a dress! Nothing makes the look more cozy than a sweater. This outfit is a casual one. 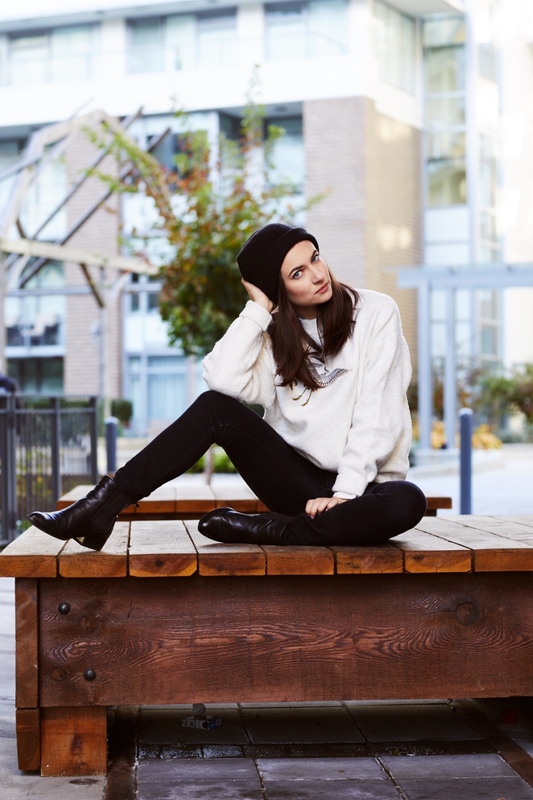 I paired this super soft sweater from H&M with black pants and a toque – instant laid back vibe maker. You already know by now that I always look for a unique detail in everything I wear and this sweater is no exception: I fell in love with the birds embroidery, I think these are cranes? This look is pretty monochrome. The only two colors I used are black and white, but you can never go wrong with these two! I like the simplicity and cleanliness, and sometimes, that’s all you need!